A legend in the make!!! Its been quite a while since I watched a telgu movie.. After “Leader” and “Ye maaya chesaave” I had kinda taken a break from telgu movies. It so happens that whenever i feel bored to the core and mind demands some awesom fun and entertainment I watch a telgu movie, preferring it in a theatre. Telgu Industry is one such dedicated place where movies are done with ultimate passion and offers a lot of entertainment! 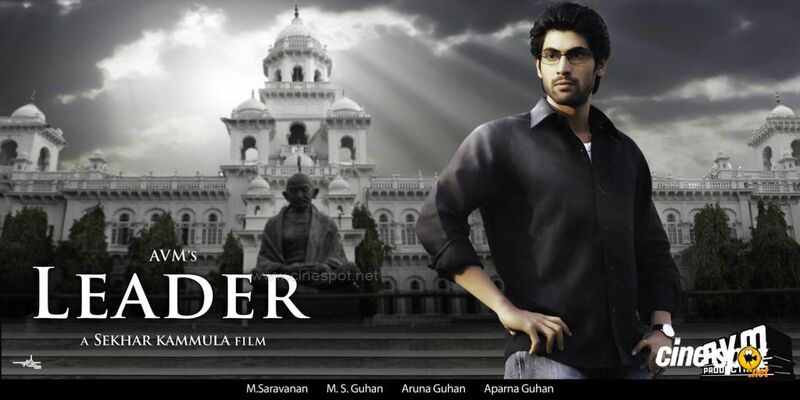 Everyone who has seen Shekar Kammula’s previous movies Anand, Godavari and Happydays knows his caliber as a director. He has a peculiar way of narration and has got his own style. Leader, like all his other movies moves in its own pace, a bit slower when compared to usual commercial flicks. Its a story of a 28year old PhD holder who becomes the CM of the state to fulfill his fathers last wish. Its about the vision of a great man and how his son gives up his successful career to make it a reality. Its about the Dirty politics v/s Value politics. We have seen Shekar’s view on youngsters aspirant to join politics in one of his movie Godavari, and the same spirit is unleashed in Leader in full pledge and debut-ant Rana has carried it off so well which proves that he will become another valuable asset in the industry. The first half of the movie rounds on how Arjun (Rana) plan and execute to step into the chair of CM. The next part of the movie is about the hurdles and oppositions that he faces within the party and how he overcomes it. The survival makes him to compromise once with his values and he pays a lot for it which is a turning point in the movie. The narration picks up the speed nearing to climax and ends with Arjun winning the by-elections. give me your mail id and I promise to send mail, only when a new post is up! "Live every moment, Live Intense, Celebrate Life..."
That's my philosophy in brief. Some more stories Meena hits short stories..
ಕಾವ್ಯಸುರಾ Raaki’s blog.. amazing kannada poems..